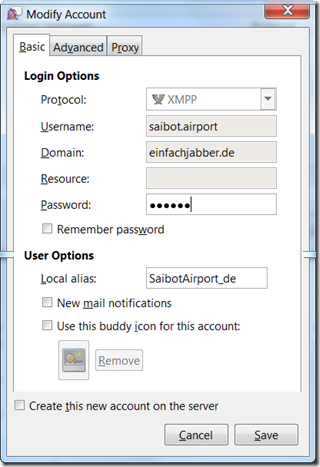 There are many services offered on the internet where you can easily create free XMPP chat accounts. I have made use of two of these – https://duck.co/ and http://www.einfachjabber.de but you can of course create your own. 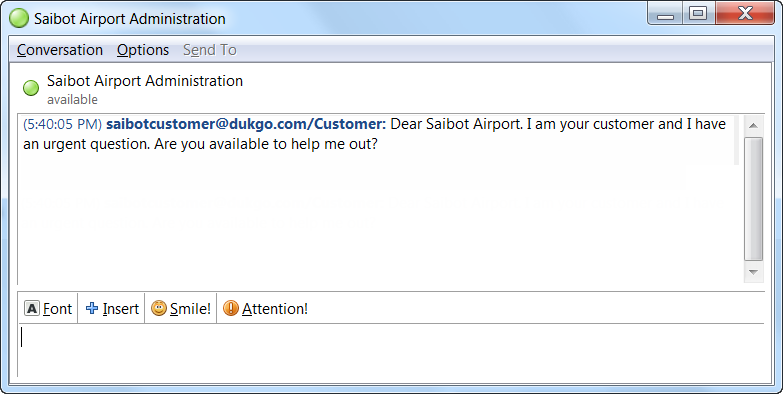 At DuckDuckGo I created an account called saibotcustomer ( @dukgo.com) – this account is used for the fictitious airport Saibot Airport in Lexville that is central in the case for the Oracle SOA Suite 12c Handbook that I am in the middle of writing). 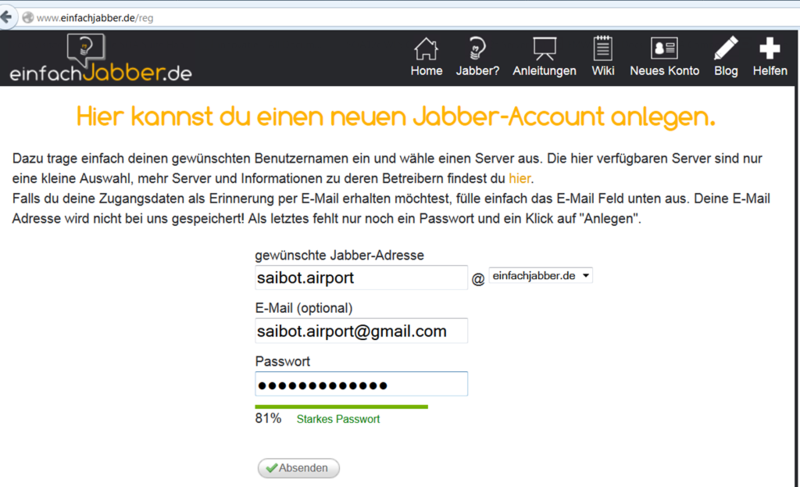 At einfachjabber.de I created an account called saibot.airport (@einfachjabber.de). This second account will represent the information desk of the imaginary airport. 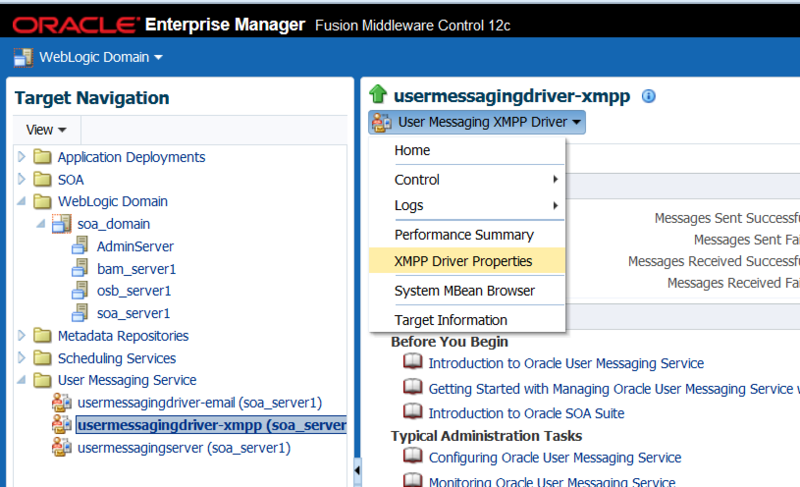 This account will be the one used to configure the XMPP driver in the SOA Suite run time environment. There are also many clients that will help you interact with XMPP servers and with your chat contacts. I have used the open source Pidgin client for this example: http://pidgin.im/. This client can connect with many other chat (IM) services in addition to XMPP, although that is not relevant for me in this case. In Pidgin, you can manage multiple XMPP (and other protocol) accounts – and interact through each of them. 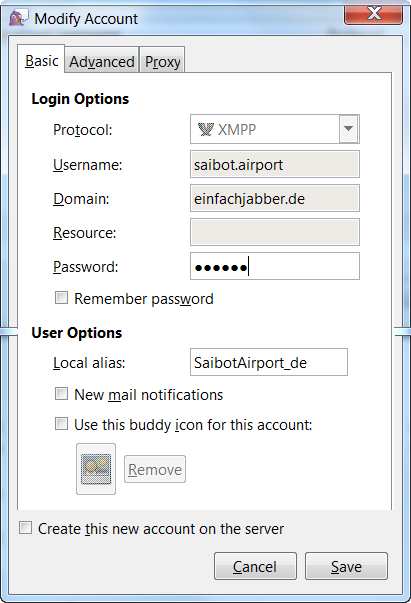 Here we have account SaibotCustomer@dukgo.com add saibot.airport@einfachjabber.de as his new best buddy – using the local alias Saibot Airport Administration. and we have now established that the two accounts are working, Pidgin is doing a fine job of connecting to both and they can talk to each other. 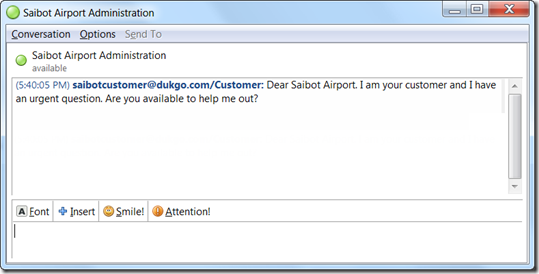 The question now is: can the SOA Suite also talk to the customer, on behalf of the Saibot Airport staff? 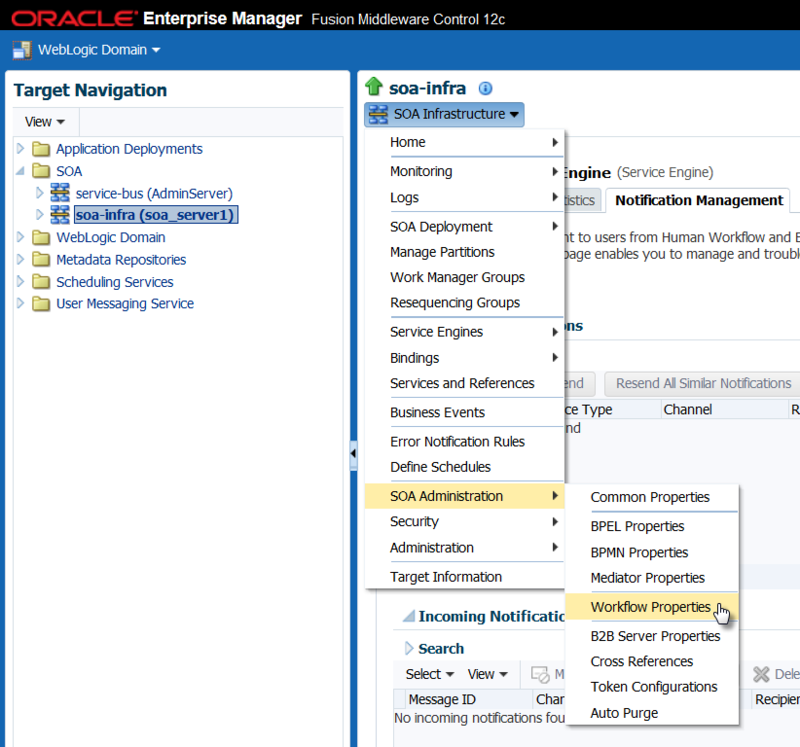 After creating a fresh installation with the Oracle Installer – configuring separate managed servers for SOA Suite (soa_server1) and Service Bus (osb_server1) next to the AdminServer – I discovered when I fired up my WebLogic domain that the libraries and applications required for doing the XMPP conversations were installed, but not yet deployed to the soa_server1 target. <Aug 5, 2014 3:41:57 PM CEST> <Warning> <oracle.sdpinternal.messaging.driver.xmpp.XMPPResourceAdapter> <SDP-26200> <An exception was caught. 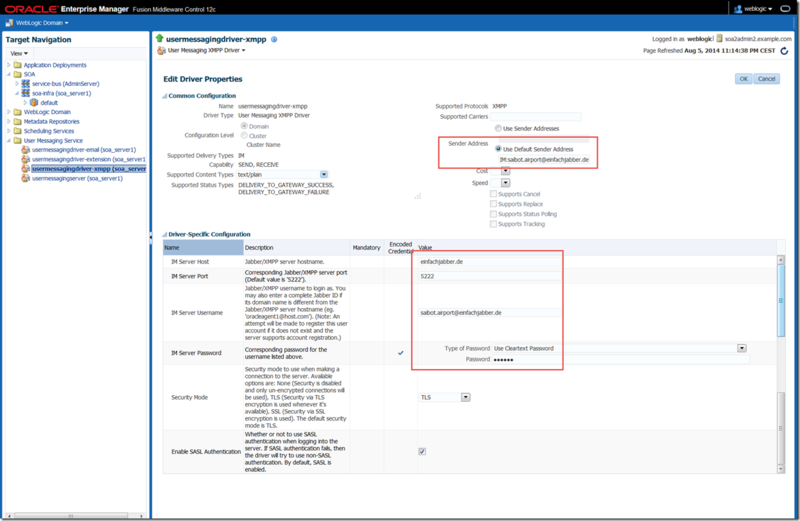 oracle.sdp.messaging.driver.DriverException: XMPPDriver could not initialize. 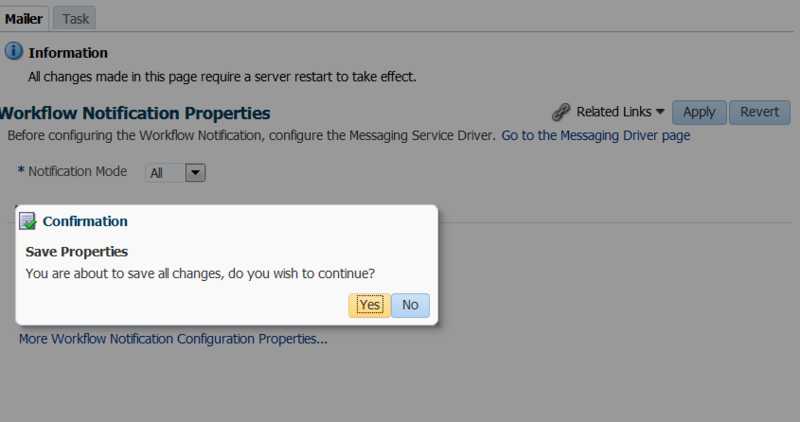 This problem occurred when the configuration for the XMPP driver was invalid and did not allow the driver to correctly startup. In this specific case I tried to configure the XMPP driver for Google’s chat service – something that I do not believe is possible at this point in time. Or at least, I have given up on it. It was present in the log file before I had created the XMPP Driver configuration (see the next section) (and after I had deleted that configuration). which was the result of the previous message: no (valid) configuration was found and there the XMPP driver was not available at all. The remedy clearly was to add a valid configuration. Open the EM FMW Control. 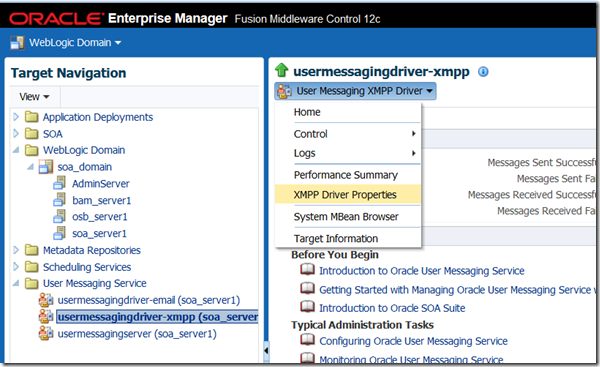 Click on the node User Messaging Service | usermessagingdriver-xmpp (soa_server1). 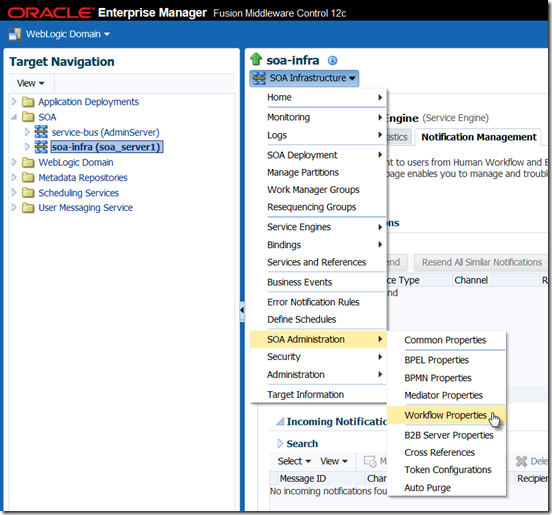 Note: soa_server1 is the name of the managed server; in your environment this managed server may have a different name. 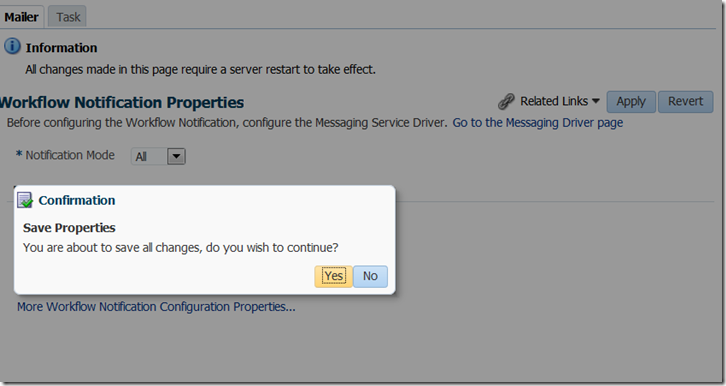 IM Server Password – the password for the account configured under IM Server Username. Note: I am not sure whether the sender address has to be specified as well. 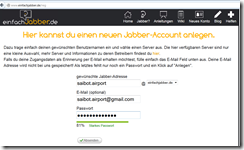 I have set it to IM:saibot.airport@einfachjabber.de and it works – but if it is necessary or even relevant, I am not sure. In the page that appears next, set the Notification Mode to All . Press Apply to make the change last. 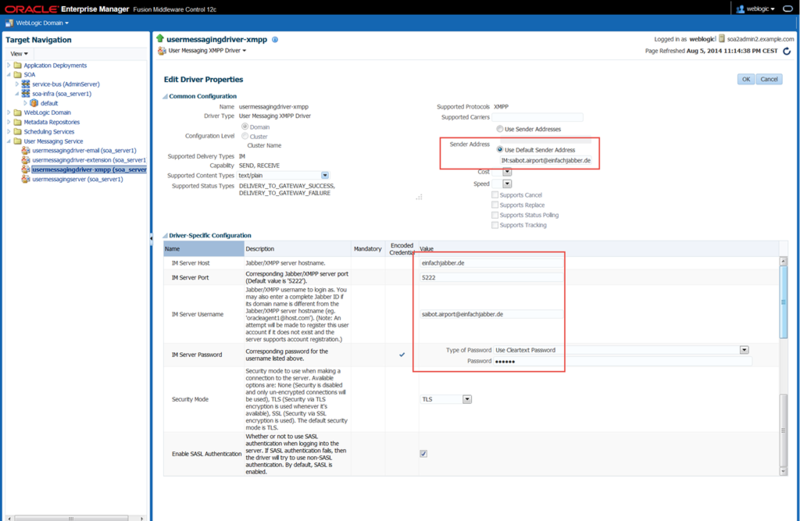 At this point, you may need to restart the managed server – to me it seemed necessary, but maybe first try the next section without a resort and keep it in mind when you run into an error mentioning the Notification Mode. 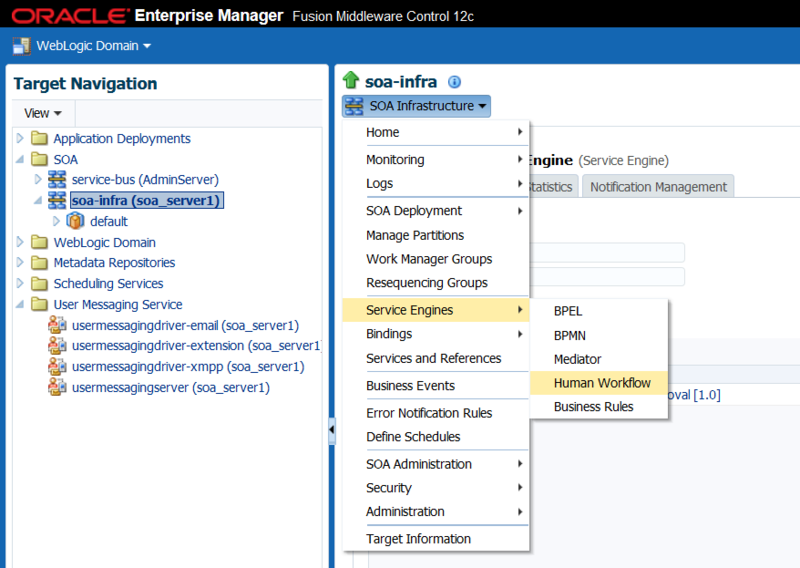 Select the node SOA | soa-infra. 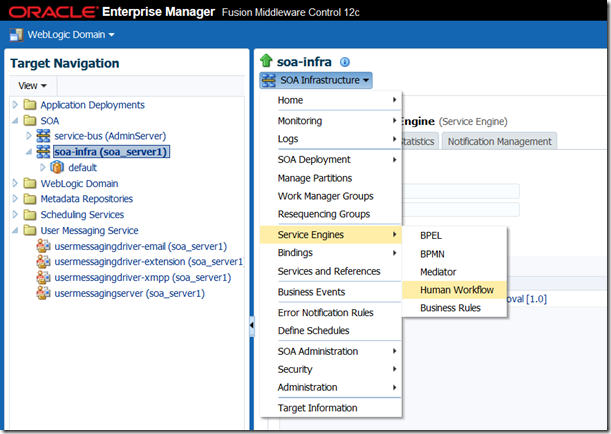 Open the dropdown menu and select Service Engines | Human Workflow. Open the tab Notification Management. Click on Send Test Notification. In the popup that opens next, set the Channel to IM. 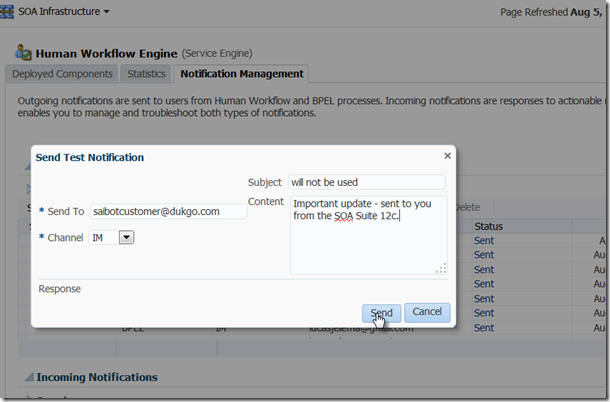 Type the destination XMPP account (in my example saibotcustomer@dukgo.com) in the Send To field. Note: this should not be the account configured in the XMPP Driver configuration, because that is the account from which the message is sent. The subject is not relevant for instant messaging. The content however is. Press the Send button. This proves that our configuration is correct. 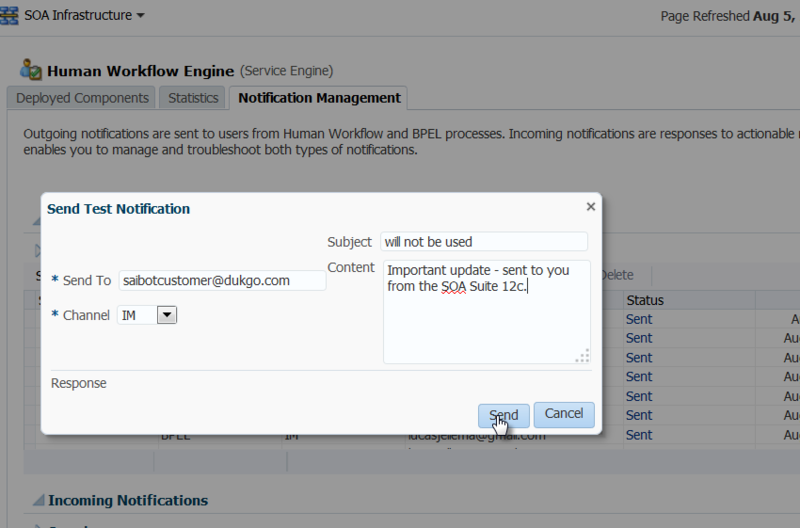 The Notification Management tab contains an overview of the Outgoing Notifications that have been sent. Here we see an entry for the test message that was sent through the IM channel. 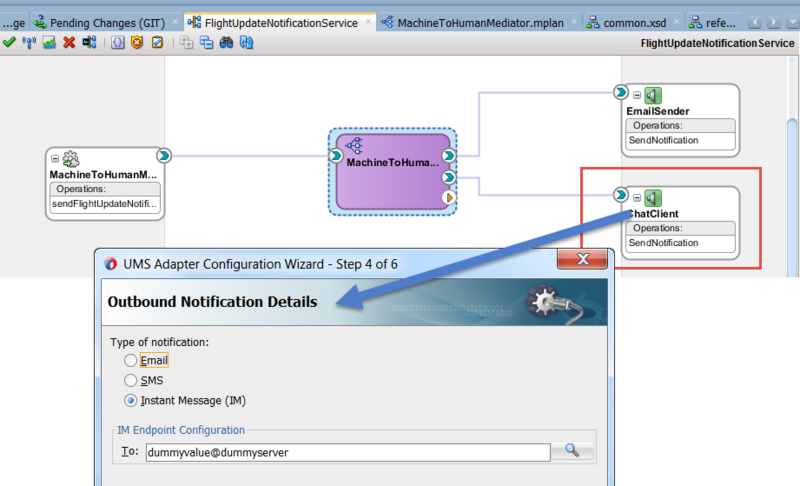 Now that we know that our UMS service is capable of sending chat messages, we can leverage this in SOA composites that use the (outbound) UMS Adapter, configured for the IM channel. 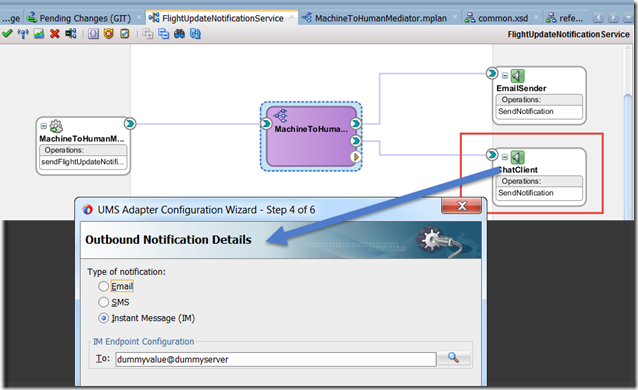 Simple SOA composites (or complex ones for that matter) can easily send out chat messages to human partners (or anyone with an XMPP account).